AIDT was established to build a healthy state economy by recruiting and training a skilled workforce to attract new industries to the state and to expand existing industries. Job-specific pre-employment and on-the-job training programs are provided. The organization provides a full range of customized technical training programs that are offered at no cost to employers and to the trainees. Leadership training programs are also available. In addition to training, AIDT offers services including trainee recruitment and screening, safety assistance, industrial maintenance assessments, and continuous improvement/process improvement assessments. Training is conducted by AIDT staff or contracted instructors and delivered through classrooms or 38 Mobile Training Units (MTUs) customized to meet specific company needs. MTUs go directly to the employer site to provide classroom and hands-on training. The Mission of AIDT is to provide quality workforce development for Alabama’s new and expanding businesses, and to expand the opportunities of its citizens through the jobs these businesses create. 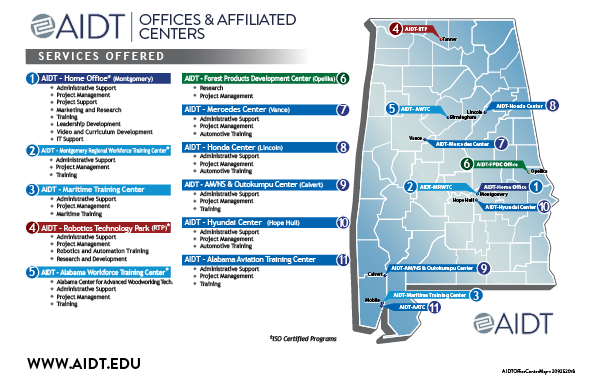 AIDT, a division of the Alabama Department of Commerce, encourages economic development through job-specific training. Training services are offered in many areas, at no cost, to new and expanding businesses throughout the State. AIDT’s Total Workforce Delivery System has provided thousands of skilled, motivated employees to Alabama industries since 1971. A quality workforce for Alabama industries requires a quick and complete response. AIDT provides on-the-spot training even before you have a place to provide on-the-job training.